BlackBerry Messenger 5.0 Leaked | BlackBerry Blast! 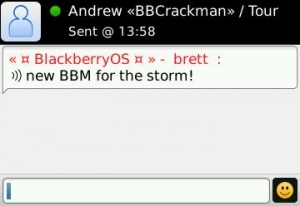 The BlackBerry Messenger has not been officially released yet, but it has been leaked on to the web. You can download BlackBerry Messenger for just about any BlackBerry device you have. "To install just extract the zip file on your computer. Remember the location. Open up Desktop Manager and click on Application Loader. Under Add/Remove Applications press Start. When the screen comes up with all the apps on your device, select Browse and navigate to the folder you extracted from the zip. Choose the BlackBerryMessenger.alx and click next. Then just wait for the phone to reboot and walla, the brand new BBM 5."